In the debate over Britain leaving the European Union, and how prosperous and powerful the country could be after independence, commentators on both sides often pick the example of Norway, a flourishing country with world-beating living standards and a healthy economy. Norway has a half-in, half-out relationship that gives it free trade with Europe but keeps it out of the EU’s political institutions. David Cameron has dismissed the Norwegian alternative with the blunt assertion that Norway ‘has no say at all in setting [trade] rules’. The prime minister’s fear that Norway lacks influence might be grounds for dismissal if it stood up to scrutiny. But does it? In ‘The Norwegian Way’, Civitas research fellow Jonathan Lindsell examines the situation in detail, using government reports and communication with some of Norway’s leading stakeholders and companies. In fact Norway enjoys more favourable terms than is often appreciated, including significant influence over single market legislation and a veto to remove itself from onerous laws, while it also maintains a strong degree of cooperation with the EU in various policy areas. 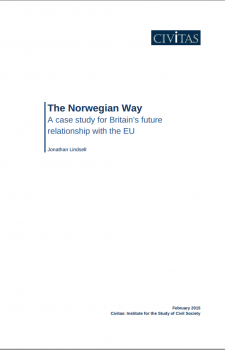 Lindsell writes: ‘The Norwegian approach to the European Union offers a genuine alternative to consider. This is not to say that overall the Norwegian option is superior to EU membership or any other international arrangement, but that the strongest criticisms levelled against Norway are wide of the mark. Jonathan Lindsell joined Civitas in 2013 as EU research fellow after reading modern history at Trinity College, Oxford. His other reports include Softening the Blow and ‘Does the EU impede economic growth?’ He has written for Vagenda, Left Foot Forward, The Independent, Index on Censorship and Open Democracy.